Matterhorn miner boots are proven under pressure! Matterhorn footwear meets and exceed safety requirements while keeping your feet dry and comfortable all day long, offering high-performance components and technology. 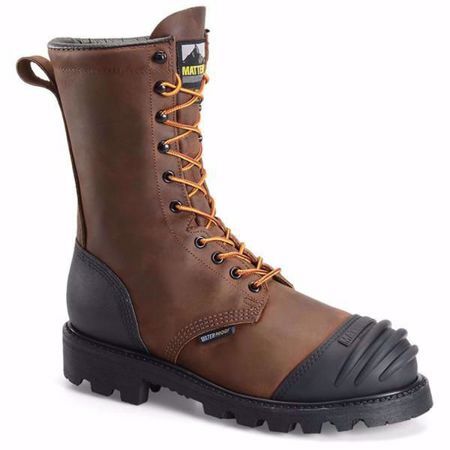 The MT910 Tigertip metguard boot provides ASTM F2413 protection and electrical hazard resistance. Brown Full Grain Leather Upper. Cambrelle Breathable Moisture Wicking Lining. Vibram Big Horn Rubber Outsole. Steel toe meets or exceeds the ASTM F2413 Standards for compression and impact testing rating of I-75/C-75. EH - meets ASTM F2413 requirements for Electrical Hazard Resistance. Made in the USA in Martinsburg, PA.
Matterhorn TigerTip - A patented high-abrasion boot tip that provides superior protection and extends the life of the boot. Cove Shoe Company, a division of H.H. Brown Work Group, has been making Matterhorn boots for miners for decades. Matterhorn Mining Boots are tough, innovative, and provide maximum safety and quality for workers in the coal mining, mineral mining and precious metal mining industries.